Few events in American history are as important, or as complex, as the Civil War. Anyone with an interest in our history--where we as a nation were then, where we are now, and how we got here--cannot help but be drawn to this signal event. We are very fortunate to have so many parks, museums, and memorials dedicated to preserving the memory of the war and the knowledge of specific events from that unsettled time. Then too, each year thousands of reenactors in authentic dress take to the former battlefields to bring that history alive. These impressive demonstrations are both educational and exciting to watch. Each battle site, museum, and memorial presents a piece of the larger historical puzzle that was the Civil War. I believe a firm understanding of that larger picture--the whole run of events--not only adds clarity, but also greater meaning to the specific events. To that end I’ve designed the Chronology below to provide a clear, easy-to-follow timeline of the events of the entire war. Not every battle or every general is included. The Chronology is an overview to provide the context for this chaotic time. Use it as a learning tool, for review and reference for important facts and dates, or just to satisfy your curiosity about some aspect of the war and its causes. All of this I hope will further the understanding of this signal event in the history of our nation. - Over 140 Civil War related illustrations--including paintings, sketches, and photographs--of battles, generals, and other key figures in the war. - Clickable links (highlighted text) to federal, state, and other historic parks at specific entries (such as battles) where you can find a wealth of travel and historical information. 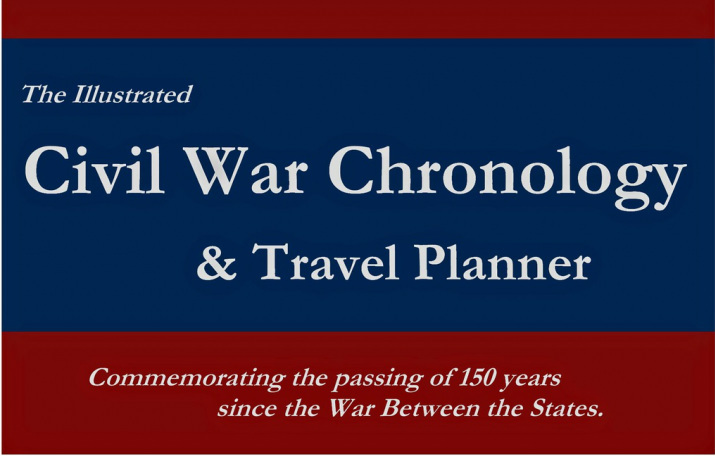 - Links to scheduled reenactments by units of Civil War reenactors, for those who like to see history brought to life. - A separate web page listing battles and other events alphabetically and linking back to the chonology. - The Before the War page at the end of the main chronology provides a summary of issues and events leading up to the war. of Important People, Places, and Events, From Ancient Times to the Present, published by Henry Holt. Unless otherwise specified, all illustrations in the following pages are courtesy of the Library of Congress. described in detail on the home page of this site. Click here to find out more about Lost Treasure. By way of introduction: The Civil War set the Southern agricultural states, whose plantation economies depended upon slave labor, against the more populous industrial Northern states, where by the mid-1800s strong anti-slavery sentiments held sway. 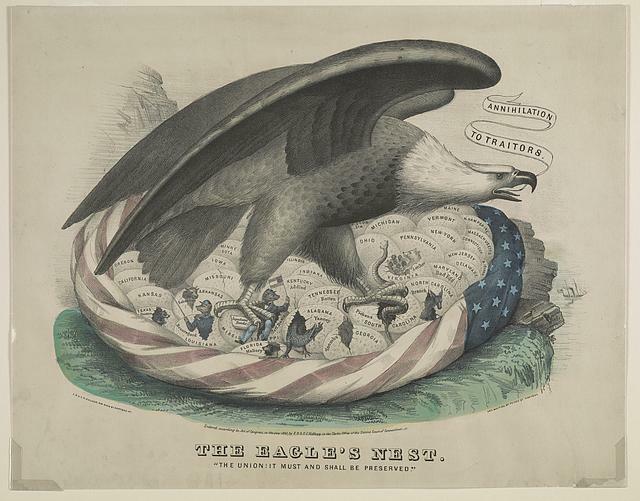 Complex issues contributed to the outbreak of war, chief among them being states' rights vs. federal government authority, and the overarching moral and economic issue of slavery. The war itself plunged our divided nation into a time of great chaos. It also bore witness to inumerable acts of heroism on the battlefield, unrelenting determination in the face of overwhelming odds, and monumental loss of life. Unrelenting too were the inevitable advances in military tactics and technology during the Civil War, including the use of railroads to move troops, the first ironclad warships, the first one-piece metal cartridges, and the Gatling gun, a hand-cranked machine gun that saw limited use. Ultimately, the war caused widespread destruction--mainly in the South where most of the fighting took place--and cost a staggering 600,000 lives. But the Union victory preserved the United States, asserted the primacy of the federal government, and brought an end to slavery. 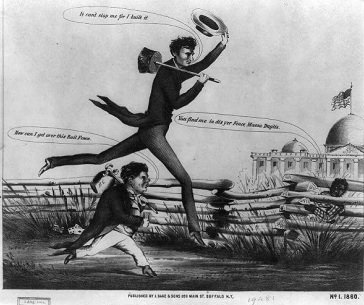 Cartoon showing Lincoln's long-legged advantage in the election. Nov. 1860 Presidential Election Democrats split over the slavery issue during the election campaign. 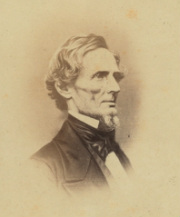 Senator Stephen Douglas ran as candidate of Northern Democrats, John Breckinridge as candidate of Southern Democrats. Abraham Lincoln, the Republican candidate, ran as a moderate, opposing the extension of slavery into new territories but not in states where it already existed. 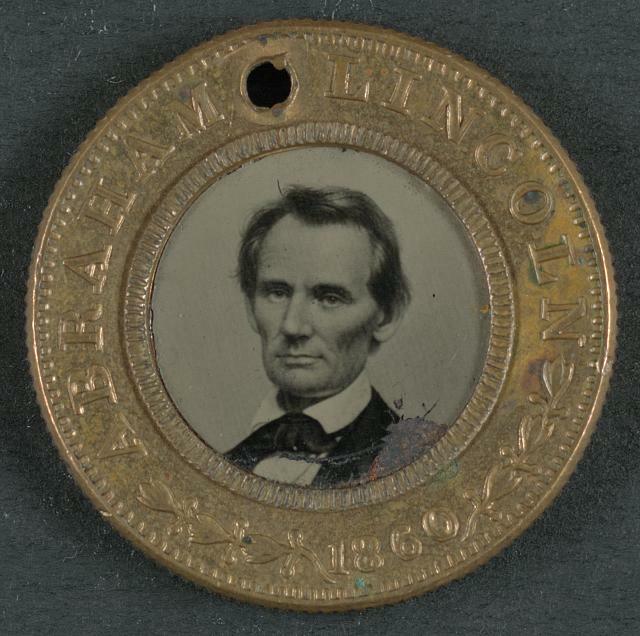 Lincoln’s narrow victory in the election (Nov. 6) provoked the secessionist movement in the South and thus provided the immediate spark to ignite the war. 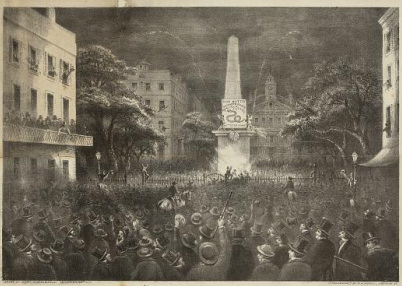 Crowds celebrate secessionist sentiment in Savannah. by one vote (Mar., 1861). 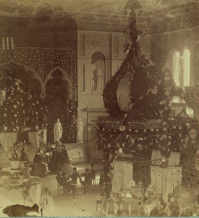 Interior of Charleston's Secession Hall. Dec. 20, 1860 Ordinance of Secession adopted by South Carolina in response to Lincoln’s election. Other Southern states soon followed (from Jan., 1861). President Buchanan refused to use force to prevent secession. 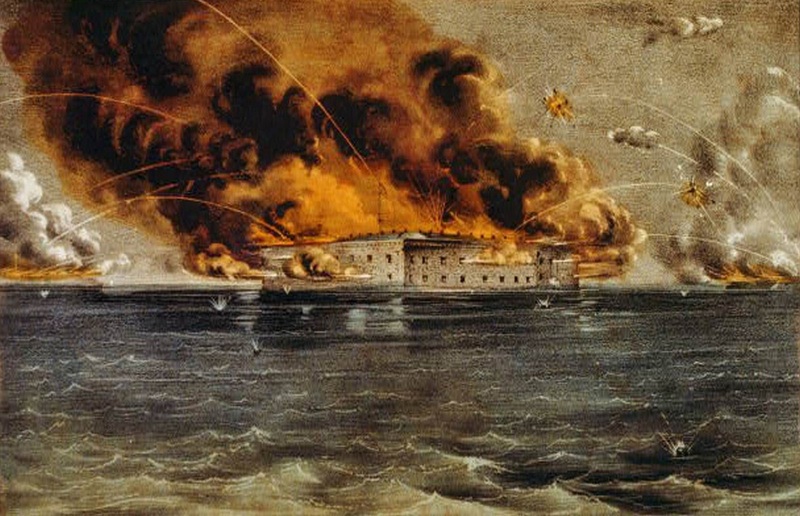 Jan. 9, 1861 Confederates fired on Union supply ship attempting to relieve Fort Sumter in Charleston, S.C. harbor. The Union ship withdrew. Jan.-Feb. 1861 Mississippi seceded (Jan.9), followed by Florida (Jan. 10), Alabama (Jan. 11), Georgia (Jan. 19), Louisiana (Jan. 26), and Texas (Feb. 1). 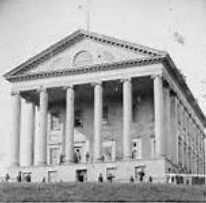 Feb. 4, 1861 Confederate Congress convened by representatives of seceding states at Montgomery, Alabama. The Congress created a provisional government of Confederate States of America (Feb. 8) and elected Jefferson Davis its provisional president and Alexander Stephens provisional vice president. Their provisional status lasted until voting in regular elections in the Confederate states (Nov. 6, 1861). Feb. 1861 Washington Conference is presided over by former President John Tyler. It failed to resolve North-South differences and end secessionist movement. Mar. 4, 1861 Abraham Lincoln inaugurated as the 16th president. In his inaugural address, Lincoln said he would not interfere with slavery in states where it existed, but staunchly opposed secession. War broke out the following month. 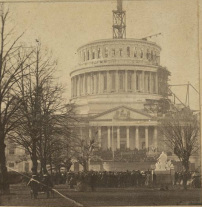 Note the incomplete Capitol Building in the photo to the right. Apr. 6, 1861 President Lincoln announced he would supply Fort Sumter in Charleston, South Carolina. Apr. 8, 1861 Confederate President Davis called for 20,000 volunteers for the Confederate army. Apr. 1861 Fort Sumter. This fort in the harbor of Charleston, S.C., became the site of the first military action of the Civil War. 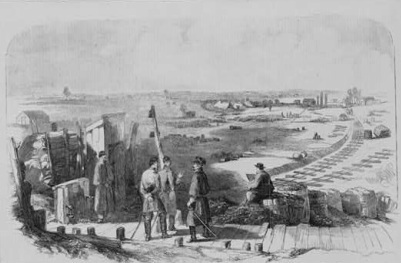 Following the secession of South Carolina (Dec., 1860), state officials demanded the evacuation of some 100 US Army soldiers garrisoned in the fort. When President Lincoln signaled his intent to resupply the fort (Apr. 6, 1861), Confederate forces led by Gen. Pierre G. Beauregard shelled it (Apr. 12–14), forcing its evacuation. The fort was not recaptured until 1865. Apr. 15, 1861 Lincoln called for 75,000 Union volunteers and ordered a blockade of ports of the seceding states (Apr. 19). Maintained throughout the war, the blockade of over 3,000 miles of Confederate coastline seriously hampered, but never completely stopped the flow of goods from overseas. The Confederacy responded to the blockade by building fast ships designed for running the blockades and by building armed commerce raiders (such as the Florida and Alabama) to prey on Union shipping. The Union Navy gradually expanded its control over Confederate shipping by establishing bases along the Southern coast. By 1864, blockade runners faced about a one in three chance of being caught. Apr. 17, 1861 Virginia seceded from the Union (Apr. 17), followed by Arkansas (May 6), North Carolina (May 20), and Tennessee (June 8). June 1861 West Virginia. Opposition to Virginia’s secession in western Virginia counties resulted in the Wheeling Convention (June 11) and formation of a Union government. The region later became the state of West Virginia (June 20, 1863), the 35th to enter the Union. Meanwhile, four slaveholding states--Maryland, Kentucky, Delaware, and Missouri ultimately refused secession and remained within the Union, despite considerable pro-Confederate sentiment. July 21, 1861 Bull Run, First Battle of. 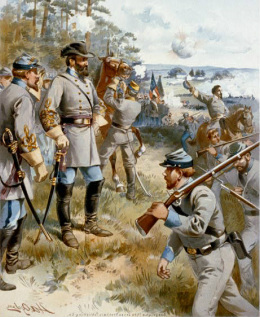 Confederate forces under generals Pierre G. Beauregard and Joseph Johnston routed the Union army at the First Battle of Bull Run, near Manassas in northern Virginia. Expecting an easy victory, the 30,000-man, untested Union force under Gen. Irvin McDowell marched some 25 miles south from Washington, D.C., to Manassas Junction, VA, where Confederates led by Gen. Beauregard awaited. McDowell’s predawn attack appeared close to victory until late in the day, when Confederate reinforcements arrived and turned the battle into a rout. (A Union plan to prevent Gen. Joseph Johnston from reinforcing Beauregard with an additional 9,000 troops, from the Shenandoah Valley (July 20), had failed.) Confederate Gen. Thomas Jackson earned his now famous sobriquet “Stonewall” for his heroic stand during a fierce Union assault at Bull Run. The Confederate victory halted this first Union drive to capture Richmond. Casualties were about 3,000 Union to 2,000 Confederate. Defeat at Bull Run dashed Union hopes for a speedy victory, forcing a new Union strategy, which included continuing the naval blockade of the South, taking control of the Mississippi River (to split the Confederacy), and capturing Richmond, the Confederate capital. Stonewall surveys the battle scene. 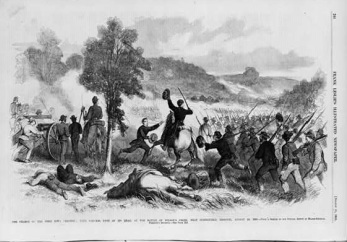 Battle scene at Wilson's Creek. Aug. 1861 Wilson’s Creek, Battle of Confederate victory over Union forces near Springfield, Missouri, on Aug. 10, 1861. 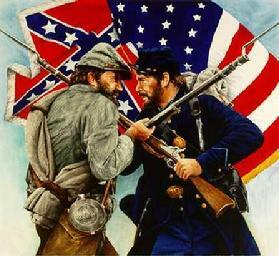 A Union force of some 5,400 intercepted an invading force of 11,000 Confederates marching from Arkansas. After a hard battle Union troops were forced to withdraw. The Confederates then took Springfield in their drive to take control of this slaveholding Union state. Nov. 1, 1861 Gen. George McClellan named commander of the Union army, replacing Gen. Irvin McDowell. McClellan formed the Army of the Potomac and later stopped the Confederate advance at Antietam. Nov. 8, 1861 Trent Affair During the Union blockade of the South, the US vessel San Jacinto, commanded by Capt. Charles Wilkes, seized the British mail steamer Trent on the open sea and removed two Confederate commissioners (Nov. 8). At the demand of the British, the commissioners were released and an international incident was averted. US San Jacinto overhauls the British steamer Trent.